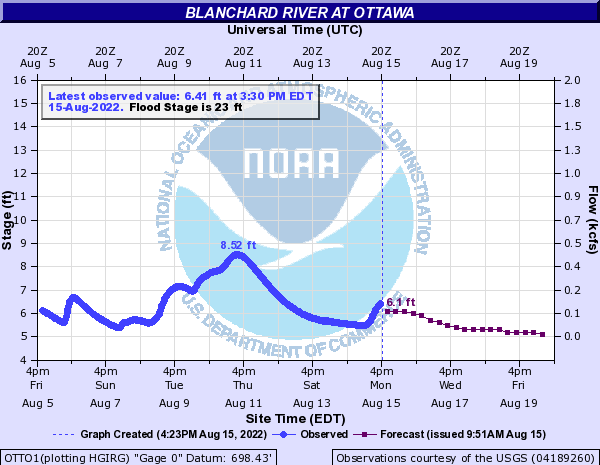 OTTAWA — The Blanchard River in Ottawa is expected to crest at 23.3 feet at 1 p.m. Friday, according to the National Weather Service’s Advanced Hydrologic Prediction Service. On Wednesday morning, the river was at 20.04 feet. The river started rising Sunday and was at 10 feet, said Brentley Lothamer, National Weather Service meteorologist. 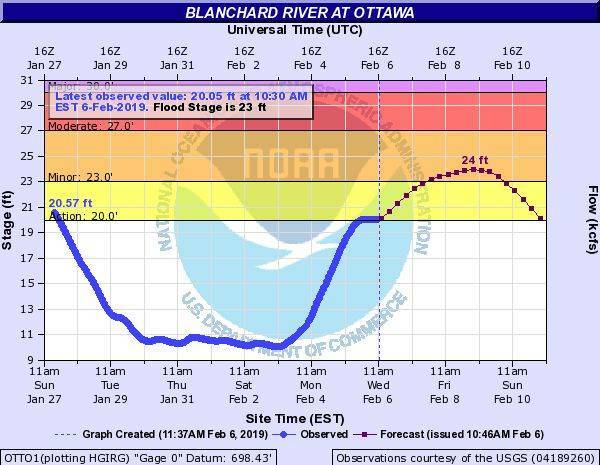 The action stage for the Blanchard is 20 feet, with minor flooding expected at 23 feet, when lowland flooding occurs mainly in south Ottawa, with floodwater in low farmlands. Today’s outlook calls for up to three quarters of an inch of rain with a 100 percent chance of rain all day. The record crest level for the river is 33.3 feet March 25, 1913.